OUT: William Gallas (Contract Expired); Sol Campbell (Bosman Free Transfer, Newcastle); Mikael Silvestre (Contract Mercifully Expired); Philippe Senderos (Bosman Free Transfer, Fulham). LAST SEASON: We brought over the as-yet-unknown Vermaelen from Ajax, and while we desperately needed reinforcements, no one knew what to make of the Belgian. "He's too short," some said. "He has no experience," others chimed. Fans can be forgiven for being a bit hasty; after all, Le Boss has had a spotty history with signing defenders *COUGHSTEPANOVSCOUGHCOUGH* in the past. Nevertheless, in this instance he struck gold. Vermaelen started off like a house on fire, scoring in his league debut against Everton and showing that it didn't matter that he wasn't super tall, since he could leap tall buildings in a single bound. Vermaelen quickly became our defensive superman, a hard-nosed player who would tangle with opposing forwards and just as easily bomb forward and score. 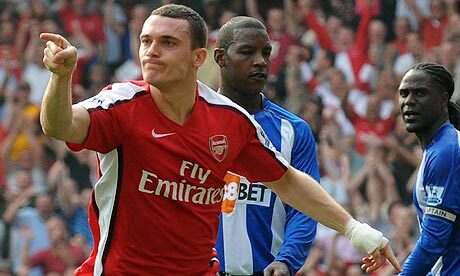 It's no coincidence that our defense fell apart once Vermaelen went out with an injury. Here's hoping he can stay fit for every match, as we're rather thin right now. THIS TIME: No longer an unknown quantity, Vermaelen enters the season a fan favorite and an acknowledged leader of the team, a lieutenant to Cesc. He is a player that his teammates, coaches and fans all respect and trust to do the job. But while last season the Verminator was able to break into the lineup alongside the temperamental but very talented and experienced William Gallas, he will now find himself breaking in a new partner in central defense (although no one is sure just who that is, exactly). Tommy's season may hinge as much on his partner as on himself. LAST SEASON: Played in Ligue 1 last season for FC Lorient, and in Ligue 2 the season before. I had never seen him play, much less heard of him, before this summer. I was actually shocked that he was on FIFA 10. THIS TIME: The main complaint surrounding this signing is that he has the upper body of a 12 year old boy. Rail-thin center backs do not inspire much confidence once you realize that they'll have to go up against the likes of Drogba, Rooney, even Kevin Davies: big, strong forwards who have and will continue to use physical force to get by defenders and score. And we've seen those same forwards do the same to Arsenal defenders for several years, so my own nerves have been on edge about this since he was introduced wearing what appeared to be a boys size Small shirt. Please don't get me wrong; I hope sincerely that the Kos is everything Wenger thinks he will be, fast, strong with a knack for breaking up attacks and putting himself right in the attackers' way. He did so effectively in our preseason fixtures, but once things went beyond the having-a-run-out pace and Legia really started going for it, Koscielny was exposed. Even without the OG he knocked in, he had an exceptionally poor match in a 6-5 win in Poland. Wenger seems convinced he's the real deal; I'm reserving my judgment, but I don't have a very good feeling. LAST SEASON: Sagna went through his third season at Arsenal rather uneventfully; there were no goals against Chelsea or dramatic bicycle goal-line clearances. In fact, his most memorable contribution was probably a cross to RvP to score against the scum. But unlike forwards, nondescript is not necessarily terrible for a defender. It denotes consistency, which is perhaps the most misunderstood part of Sagna's game. He does everything pretty well, nothing too poor. Sure his crossing isn't the greatest, but then no one on Arsenal can whip in a decent cross, so it's difficult for me to hold fault with him there. THIS TIME: More of the same if you please, Bacary. While we're certainly more attacking when Eboue is in at fullback, Sagna also provides defensive assurance, which is in short enough supply at Arsenal. He's steady and ever-present, and I love him for it. Give me Sagna over just about any right back. LAST SEASON: Same story as many of our top players, Gael spent large chunks of last season out with injuries. While our immediate backup was also hurt, we were down to our third-choice left back for a long spell. Upon returning, Clichy needed a few weeks to settle back in, but once he did so, played pretty well, I thought. He'll always be compared to Cashley since he was the one who replaced him, and I suspect that's where the criticism of his crossing comes in. That and the fact that he can't cross. He's still liable to make a mental error or over-pursue an attacker, but on the whole was pretty solid. THIS TIME: Tough to say. He's obviously our first-choice left fullback when healthy, but it would not surprise me to see him encounter competition from his young backups. It seems fairly certain that the 2007-08 season, when Clichy was regarded as the best left back in England, will never be recreated, but Gael can still certainly do the job. Perhaps competition will cause him to focus on his game and see some improvement, although I wouldn't exactly hold my breath. LAST SEASON: Eboue went from the fans' most hated list to the top of the most beloved last season. Gone were the theatrical displays of falling down, diving for fouls and cards which alienated him from the average Arsenal fan. 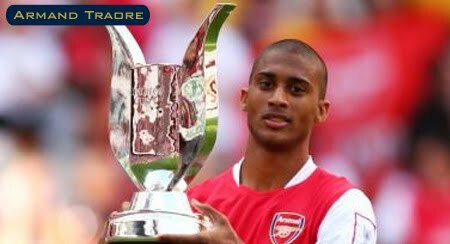 His industry and work rate continued to be phenomenal, certainly one of the hardest working players in an Arsenal shirt, and he finally seemed to figure out his wide midfield role enough to feature prominently for us in away fixtures. He's a cult hero and seems a genuinely good guy. THIS TIME: I decided before writing this section to include Eboue as a defender because there are fewer of them. Then his fantastic display against Warsaw on Saturday went down and I immediately regretted that decision. Eboue, who is the subject of so many Arsenal songs, is also our best right-winger right now, especially with the underwhelming play of Theo Walcott this preseason (Capello must've chosen him to keep him from crying, because it certainly can't be based on his football). He's likely to start there at Anfield on Sunday, and deservedly so. Some of us come to watch Cesc, some for Arshavin. Me, I only come to see Eboue. LAST SEASON: Was cut down early on last season, recovered from that injury for I think one match, and broke a foot in that same match, effectively ending his season. THIS TIME: The highly-touted Gibbs has looked very good in preseason, and I do believe he will push Clichy very hard for the starting left back position over the course of this season, which is no bad thing. He also just got his first England call-up, so no doubt Capello has noticed his form as well. If I sound like a broken record, it's because I am: all of this depends on whether he can stay healthy. 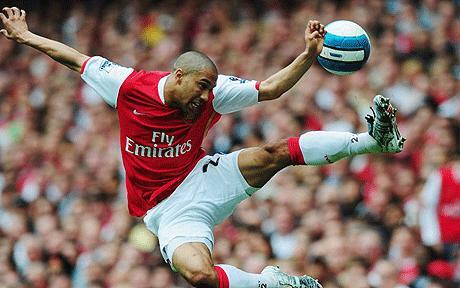 If he can, Cashley might be seeing Gibbs in his rear-view mirror just as like Clichy. He's very talented and is our biggest offensive threat from fullback, in my opinion. Where he may fall short is in the amazing lung-busting runs up and down the flank of which Clichy seems capable for 90 minutes. Perhaps we'll see enough of him this season to know for certain. LAST SEASON: Managed to break Samir Nasri's leg in preseason training before injuring his own knee and going down for the season. Otherwise we saw nothing of Johan except for the odd appearance on Arsenal TV Online. THIS TIME: He's like a new signing *chorus of boos* Okay, okay, settle down. He wasn't around, now we have him, that's all I'm saying. Okay, maybe I neglected to mention that the Swiss is constantly crocked, and that it is a virtual certainty that he will spend significant time out injured this season. Like he seems to do every season. 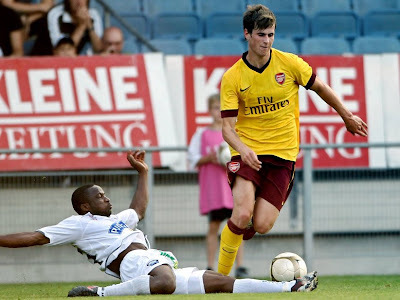 It's not his level of play (generally good) that makes me crazy when it comes to Djourou. It's his inability to play more than a few weeks in a row before something else goes wrong. He will never be able to lay claim to a starting role in defense so long as he keeps himself sidelined with odd knocks. LAST SEASON: Played significant minutes in the winter months while both Clichy and Gibbs were injured, to mixed reviews. His first few matches showed a composed, athletic fullback who do a great many things and was capable of shutting down an opponent's wing. That high level initially evaporated as his performances became gradually spottier, culminating in an abject display hosting Villa when Landon Donovan absolutely tore him apart. Mercifully, as his gaffes became worthy of our keepers, Traore was replaced by the returning Clichy. Some good from Traore, some not-so-good, but he's back again this season. THIS TIME: Will we see him push both Gibbs and Clichy? Perhaps. It's a tall ladder for Traore though, and a healthy Gibbs might put paid his chances. Given Clichy and Gibbs both have injury histories however, I don't see us selling him, especially since we lost valuable backup in the departing Silvestre (hahaha... valuable and Silvestre in the same sentence... I slay me). 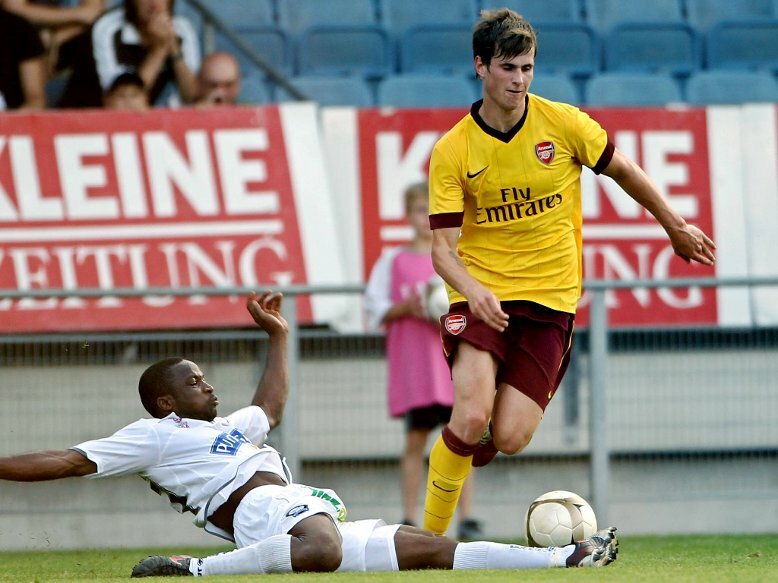 Hopefully for Arsenal, we won't need to see much of Traore. Tough luck Armand. LAST SEASON: Spent last year and the year before on loan with Nurnberg in the Bundesliga. Overall favorably reviewed, although it's all secondhand information to me, since I didn't watch a single Nurnberg match the last 2 seasons. Played a great deal of defensive midfield during his loan spell. THIS TIME: After coming over as a youth player a few seasons ago, Havard finally has his chance to make an impact on the first team. He played exclusively at right fullback in preseason and looked pretty good, but we've never seen him in truly live competitive football. He looks to have good pace and size, goes forward as well as he defends. His positioning could use some work, but again, this is all that I've noticed over a few preseason matches. We'll know more if we see him for the first team. And if it's not in Carling Cup, then we know the worst has happened and we have no more center halves. That's really the one question that needs to be asked of this preview: Where's the rest of it? If we do the math, 4 defenders out and 1 coming in is -3, for those of you scoring at home. To be fair, Silvestre leaving is sort of addition by subtraction, Senderos hasn't played for the club (except one carling cup match last season) in 2 years, so we can't really count him. That leaves Sol and Gallas leaving, with Koscielny coming in. So we're one less than we were last season. Which is nice and all, until we remember that we were short a center back going into last season from the season before as well. It seems we have fewer every season. Is it some plot by Arsene to get rid of all defenders in football? While the "Arsenal fans" writing at Le Grove would have you believe it is, I can assure you it is not. Writers with sources at the club are saying that Le Boss is holding off because players on the market are all overpriced. It's a nice theory and all, but we were burned by this nonsense a couple of seasons ago when we failed last minute with a bid for Xabi Alonso. Not only do we have to worry about failing to get anyone, but if we wait until the end of August and drop a number of points in the meantime, whoever we sign will join us as we're clawing our way back up instead of joining a full side in preseason, ready to ride roughshod over the league. Not that you or I could do anything about that. In any case, let's just hope that the Boss can straighten us out. The fourth and final overview, the Goalkeepers, is coming up on Friday as a prelude to my overall season preview. Until next time, you stay classy, Mon Arsamis. Thoughts on Liverpool, and Where Is Our Keeper?